It can be a difficult task to buy a gift for your grandmother. You want to get her something she likes, of course. But the truth is no matter what you get her, she'll like it because it comes from you. Knowing what she really wants can be tricky. You can't trust your gift-giving history; she's always a gracious gift receiver. You'll need to know going in that you've nailed it – before you actually give it. The best way to find the perfect gift for your grandmother is to spend time with her. Getting to know her is really the only way to know for sure what she'll like, what she needs and what will touch her heart. This is a simple solution if you live close or you have a close relationship, but even if you don't, you can try a few cheats that will help you get to know her, too. You can ask your parent for suggestions or to tell you stories about your grandma. Or, simply pick up the phone! As long as her hearing still works well, she'd love to hear from you, so give her a call and ask her to tell you how she met your grandpa. Or ask for dirt on your parents! Chances are, during the course of a conversation you'll be able to work out something that she would like. And even if not, you'll have given her the gift of your time (and received the gift of hers) and sometimes, that's the most valuable gift for either of you. To help you decide on the perfect gift, we've rounded up five top-rated gift ideas that might just be perfect for your grandma below. Still in need of inspiration? Check out these five amazing gift ideas that are sure to warm your grandma's heart. It's always a safe bet to get grandma something that features the names of her cherished grandchildren. She'll likely wear it with pride whenever your family gets together (and maybe even when you're apart). If she loves to talk about her grandkids, this shirt makes a great conversation starter. Best of all, the conversation will start with your name because you got it for her. This shirt can be customized with a variety of sleeve and font colors, including glitter fonts, so she can really dazzle. 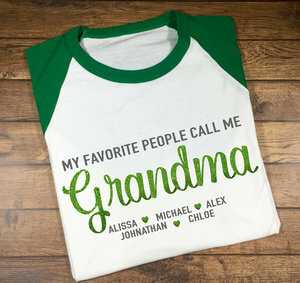 You can add up to eight names on this shirt, so as long as you don't have more than seven cousins, this is a great option for the fun-loving grandma. This is a gorgeous decor piece that will let your grandma show off her grandbabies in a subtle and classy way. And just like a mama bird, this grand-mama bird will love the metaphor of her nest holding all her grandkids. This is a wonderful gift for a grandmother who has a rustic decor and would like a constant reminder of her grandchildren (or even just a subtle reminder of any unique spelling of their names). 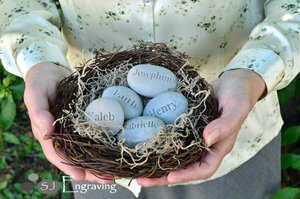 This comes with the nest as well as five laser-engraved rocks. You can choose either dark gray rocks or an assortment, and because the rocks are genuine you can be sure each rock is as unique as her grandchildren. The nest is made with real twigs to add to its authenticity. And if your family is a bit bigger, you can check this out for a bigger nest. This is a great gift for a smaller grandchild to give their grandma – and it's one they can enjoy together. 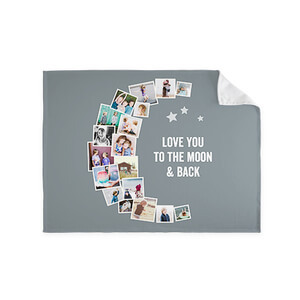 At just $5, we love the idea that a child can save up their allowance and purchase this gift all on their own, making it all the more treasured by grandma. 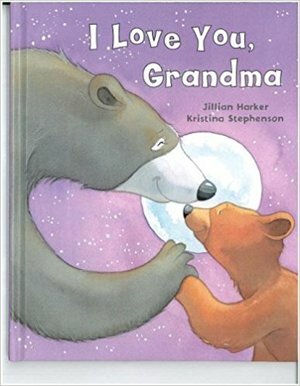 The bears in the book will parallel the grandparent/grandchild relationship in ways that will warm grandma's heart. The 8x10 hardcover book has 32 pages of grandma love. The reading level is 1st to 2nd grade, so if your child is that age or older, they can read it to her, and before then, grandma can just enjoy snuggles while she reads. 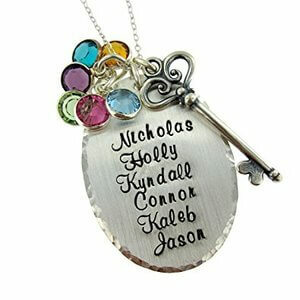 What a great way to give grandma a little bling with a sentimental touch that is sure to please. This pendant has each of her grandchildren's names engraved and a birthstone for each name hung loosely alongside the pendant. It also has a Victorian key, which symbolizes how each of those names hold a key to her heart. This necklace can be customized with up to six names and you can choose between three different chains: ball, box, or cable style. You can choose the chain length, as well, with five different size options. The necklace comes in a jewelry bag and beautiful gift box so it's ready to give – you can ship it directly to her or have it ready to go when you next see her. Your grandma loves you unconditionally – give her a gift that shows her just how much she means to you in return.